We’ve been in Montreal all weekend and just recorded a podcast from our hotel. Luckily for you this isn’t a video or else you’d see us in all our morning-breath, non-brushed hair glory! Check out this fun podcast touching on a few of the great things we’ve been up to during our few days north of the border. Enjoy some of these pictures of our time here in Montreal. i’ve never seen steak tartare before, so this is a new one for me! Hey, giff, joy and maria! thanks for the comments. joy – your comment is really appreciated. really! it is so important that we try and convey that we really are not food snobs, we like ALL types and are just snobs against processed stuff. Other than that, bring on any type! thanks again!! maria: yup, that’s steak tartare in all its raw beef glory! it’s very delicious! I’m dying to go to Montreal. We had a wonderful vacation in Toronto this summer. BTW… my German “daughter” has been doing things like flying Dusseldorf to Stockholm for 16 E, so it’s still possible to do those city breaks. Is it okay to admit a certain disappointment when I read that the first photo wasn’t chocolate? It looked like chocolate! I’m so glad that you had a good trip!! Montreal is one of my favourite (Canadian spellings, in honour of the event) cities. Amazing food that can fit any budget….and a passion for both smoked meats AND duck fat in all it’s glory. Sigh. Great pictures! Glad to hear that you had such a good time. Makes me sad that we won’t be planning a trip to Montreal anytime in the near future! Those photos look awesome. Hope you’re enjoying the trip! 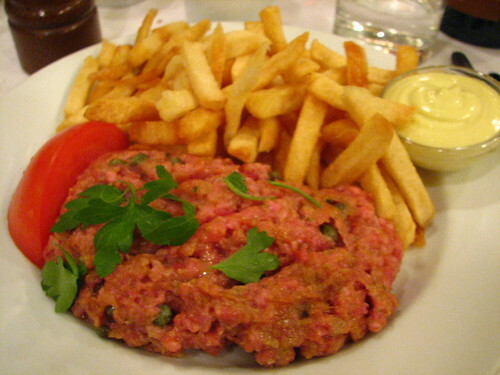 I ate steak tartare years ago…don’t know that I’d have the courage to do it anymore (doesn’t it include raw eggs)? But the sausage and liver spread look pretty good. P.S. I love those colorful cauliflowers in your Flickr slide! I love Montreal, especially the Olde City by Notre Dame. I had the best sandwich I have ever eaten in my life in a little charcuterie butcher shop down on Rue St. Denis. I still think about it wrapped up in that lovely paper. You guys are always doing something fun! Wow. I NEED to try that steak tartare. It looks amazing!! I have yet to meet anyone who hasn’t enjoyed Monntreal…it has it all, kind folks, history, architecture, art, music, nightlife and of course great food! HAhaha I thought that pate was ice cream or something. Whoops, maybe I need glasses. Everything looks awesome, and I’m glad you guys had a good time. The pics are sweet dude. Wow! I wish I was there. It all looks heavenly. 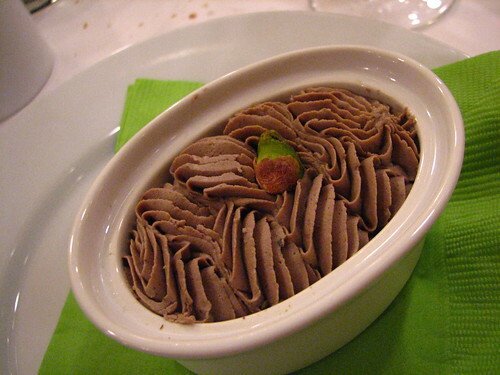 I thought the pate was chocolate mousse at first. I guess it is on my mind. But that steak tartare and frites are what is really calling me right now. i love montreal. my best friend lived there for many years and it is a great destination city. Your podcast and post make me want to go back and visit. Those sausages look amazing! 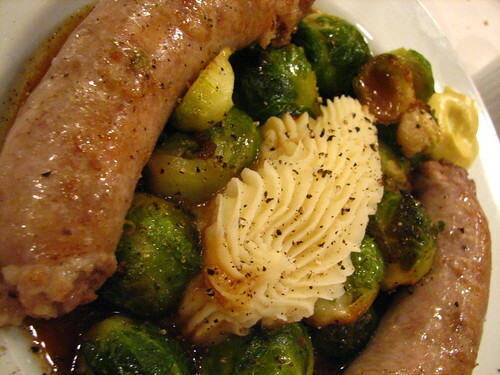 Who would have thought that something as simple as bangers, mash & sprouts could seem so delectable? Woohoo! Great to find another foodie podcast with Montreal on the plate. Angelique and I love l’Express. Check out the most recent episode of Montreal Bites : we talk about going to l’Express for an after-dinner drink. Next time you’re in town, let us know – would be cool to record a joint podcast episode! Awesome post. I had the pleasure of dining here with my wife several years back. Your dinner looks wonderful. I left Montréal 14 years ago & lament the opening of incredible restaurants since my departure. L’Express has been a staple for decades & has been surpassed by many since I left. 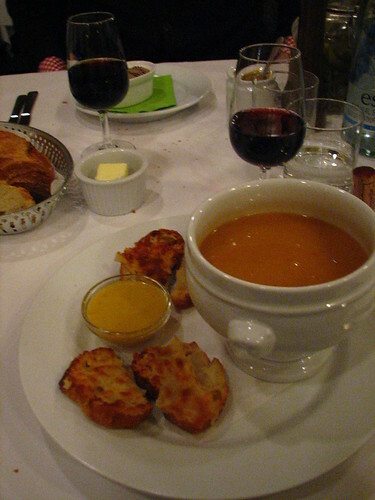 My new favourite is a French restaurant in an off the beaten track, yet relatively central location at de Maisonneuve east & Amherst called O’thym(www.othym.com). I started with a pistachio-bedded sweetbreads in apple cider, followed by the palate cleanser lime sorbet in a small bath of vodka topped with a sprig of thyme. My main course(which was not the main event, as every course was a delight to the senses) was veal kidneys in a mustard sauce with a square of scalloped potatoes with mini carrots as accompaniment. A selection of local cheeses were displayed & I opted with a not too pungent blue cheese as well as a softer mild cheese. The meal concluded with a burnt maple syrup crème brûlée(this part of Canada along with Vermont produces 80% of the world’s maple syrup). Alas, there was no room for a digestive nor coffee. In any case, it would have been anti-climatic. BTW- It is a bring your own wine(they have none), but they have at least 6 types of mineral waters(plus tap water is also an option). Prices range from $60-$75 per person for the full deal. ← It’s Finally Our Turn – Weekend Herb Blogging Hosting.